I don't suppose you have a bill of materials for this project? Maybe at least a wood list? I am planning to build from 3/4 plywood unless persuaded towards 1" planks. There is no bill of materials. There are so many materials substitutions and adaptations (like plywood for 1X pine) that what i recommend is printing out the instructions (pdf link below) and then on each page of the instructions write in the materials you will use. If you plan to acquire the materials all at once you can collate the pages to make a master list. This exercise will also help you get familiar with each step in case modifications you make in your design (example: substituting 3/4" plywood for 1" pine) cause changes in dimensions and other possible changes in the instructions which will need to be penciled in to your instructions. Incidentally, i also use the instruction sheets to make other notes and to keep track of time and cost for each step. Good point. Thanks! I hope to get into this in the next couple of days. I'll try to post some pics. The gear reduction between the exercycle and the thresher drum is not very important, and can be adjusted easily as an afterthought. Exercycles come with all sorts of gear ratios between the cranks and the flywheel. The thresher drum will work best at somewhere around 200-300 rpm. Too slow and the grain won't get threshed. Too fast and the wobble in the axis will shake the machine apart. Some wobble, remember, is good, as it shakes the seeds down. The bike chain part of the transmission will be happy with a larger ratio; the v-belt part of the transmission will be happy (there will be less friction) with a smaller ratio. In general, the flywheel stores more energy if it is turning faster (kinetic energy increases with the square of speed), so there are some reasons to have a large ratio to the flywheel (ex. 4:1 increase), and then a small ratio to the drum (ex. 1:1.2 decrease). I hope this is helpful! Thanks for your insight and target rpms. I will factor them. Cheers! The rigging diminishment between the Exercycle and the thresher drum isn't essential, and can be balanced effectively as a bit of hindsight. 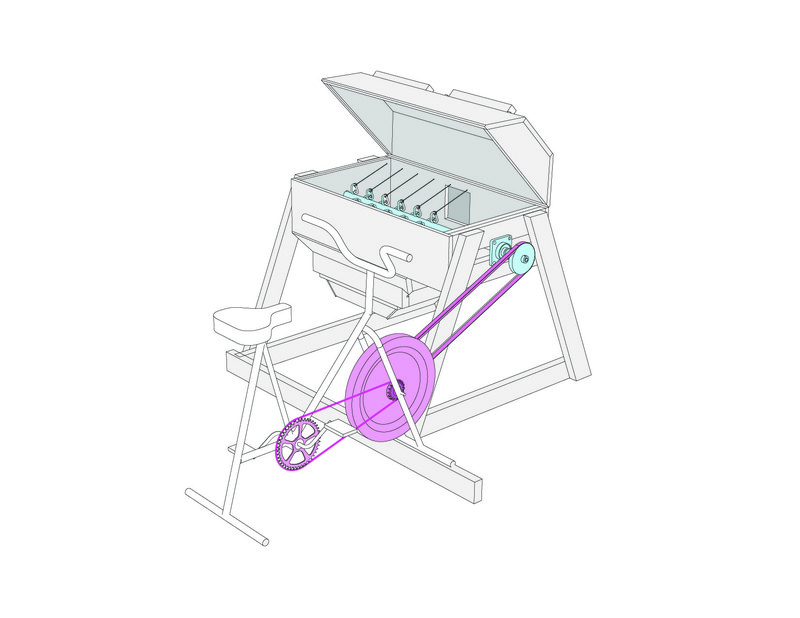 Exercycle accompany a wide range of apparatus proportions between the wrenches and the flywheel. The thresher drum will work best at something close to 200-300 rpm. https://dissertationhelp-uk.co.uk/ Too moderate and the grain won't get sifted. Too quick and the wobble in the pivot will shake the machine separated. Some wobble, recall, is great, as it shakes the seeds down. The bicycle chain some portion of the transmission will be content with a bigger proportion; the v-belt some portion of the transmission will be upbeat (there will be less contact) with a littler proportion. When all is said in done, the flywheel stores more vitality on the off chance that it is turning quicker (motor vitality increments with the square of speed), so there are a few motivations to have an expansive proportion to the flywheel (ex. 4:1 increment), and afterward a little proportion to the drum (ex. 1:1.2 lessening). I trust this is useful!